If you think you have to tackle stacks of weights to build muscle, you’re wrong. 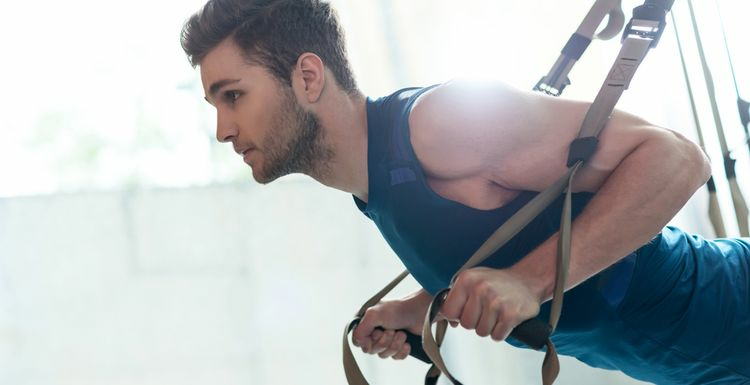 TRX suspension training will sculpt every muscle in your body, even outperforming other exercises to give you the rock-solid body you want, without lifting a single dumbbell. TRX suspension training uses two suspension straps that allow you to use your own bodyweight against gravity to build muscle and burn fat. As you struggle to maintain stability, your core is tightened, more muscle groups are engaged and worked more deeply. TRX can be adapted for all exercise abilities because you’re relying on your own ability to get your centre of gravity. Every gym does it a little differently, but as long as you’re prepared to start slowly you can progress to advanced levels easily. There’s not many of us who can do a single leg squat. But the TRX makes it a lot easier. Adjust the straps to mid-calf. Hold the handles and crouch on the floor. Face the anchor point and extend the arms. Keep your torso upright. Keep your right leg centred to the anchor and extend the left leg forwards. Pushing into the right heel, raise up to standing position. Keep the left leg extended and your torso strong. Pause on your single-leg, then lower back to the floor. Repeat up to 15 times on each leg. To intensify the move, add a hop at the top. The Power Pull is a powerful move that targets the upper back, abs, shoulders and obliques. Place your feet in a hip-width stance and face the anchor. Grab the TRX with your left hand and hold at chest height, left elbow pointing straight behind you. Extend your right arm so it’s in line with the TRX. Leaning back, exhale and extend your left arm, twisting your torso to the right as you reach your right arm out and behind you, looking behind you towards your right hand. Inhale, and reverse the move to return to starting position. Repeat for 30 seconds on each side. This is a high-intensity cardio move which works your hamstrings, quads, glutes, core, and chest. Stand, and suspend your left foot in a TRX strap behind your body. Move forward to position your body so your suspended leg is slightly stretched but knee is still bent. Quickly, bend your right knee and lower your body into a reverse lunge, placing your hands shoulder-width apart in front of you. Extend your right leg back so you are in plank position. Bend down to the ground into a push-up. Hop your right leg back in front so you’re back in a lunge position. Then, in a fluid motion, continue through by placing the right foot firmly as you push your body up into a leap. This is one burpee. Do this for 30 – 60 seconds, repeating on the other side. There's TRX at my gym but I've not attempted it yet - some of these moves sound manageable though. I'll see next time I'm in. TRX workouts are great and I am lucky that I can use one at my gym. Single leg squats with TRX feels amazing too.